Even with the weather being cloudy and rainy, more than 100 guests attended the Eglseder Wealth Management Group, Inc. 7thAnnual Shred Fest “Trash & Treasures” event on Wednesday, May 16th. A new event record for was set, with 7,695 pounds of paper shredded, keeping financial and personal information out of the hands of potential identity thieves. While enjoying an array of doughnuts, bagels, fruit and coffee guests perused the interesting and informative vendor booths. Most entertaining was getting their blood pressure checked by the Talbot County Department of Emergency Services, right after filling up on doughnuts—some of those readings may have been a little off! Charlene Upham Antiques was a hit as usual, giving free antique appraisals. A few people even left to run home and get other pieces to be looked at. Steve Bloomenhauer performed the appraisals that day. He commented that a lot of nice jewelry, silver, and artwork was brought in. There were some beautiful gold and diamond rings as well as silver flatware, pitchers, bowls, and some pretty paintings. Charlene Upham Antiques can be reached at 410-742-1392 or 410-251-3348 in case anyone has follow up questions or would like information on additional antiques they own. The Talbot Humane Society and Talbot Unleashed provided a lot of useful tips for pet owners, including how “thunder shirts” can help dogs who are afraid of loud noises or prone to anxiety. The vest-like “shirt” applies gentle, constant pressure, similar to swaddling an infant.Given the weather that day, it was a very relevant piece of information. Shore BBQ owner Montia Rice graciously provided delicious BBQ beef, turkey and ham sandwiches, which all disappeared very quickly, as usual. Additional vendors that offer services relevant to retirees in the community were also in attendance and provided much helpful information, namely, Avery Hall, CBIZ/MHM, Talbot Health Department, Home Instead, Senior Center, Smith Travel, MD Healthy Weighs, The Small Agency, Hearthstone Health & Fitness, Body Works by Britni, Partners in Care, and Talbot Mentors. 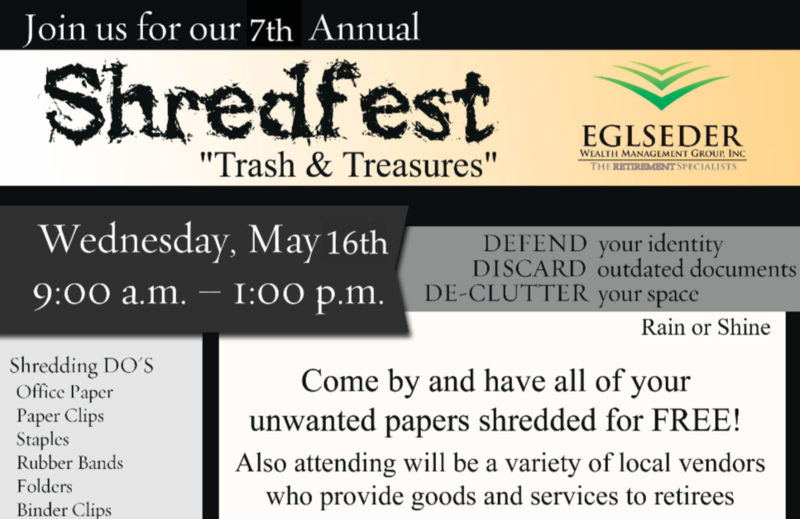 Eglseder Wealth Management Group, Inc. hosts this community-wide, free event every May to offer people a chance to shred unwanted documents (trash), receive free appraisals for antiques (treasures), and learn more about available, retiree-focused services in the area.